With sincere apologizes to Messieurs Lamborghini, Porsche, Bugatti, and Pagani, a car magazine without a Ferrari gracing its pages could not possibly have the word “Fantasies” emblazoned on its cover. Simply put, there are fantasy cars and then there are Ferraris. In the presence of a Maranello masterpiece, every other marque loses some of its luster. Even Ferrari’s hometown is a cross between an automotive Vatican and a flat-plane-crank version of Vegas, with gift shops, shrines, and museums celebrating the prancing horse. Devotees fumble with their cameras every time a red sports car screams down the narrow streets, turning unleaded holy water into the holiest of hydrocarbons. 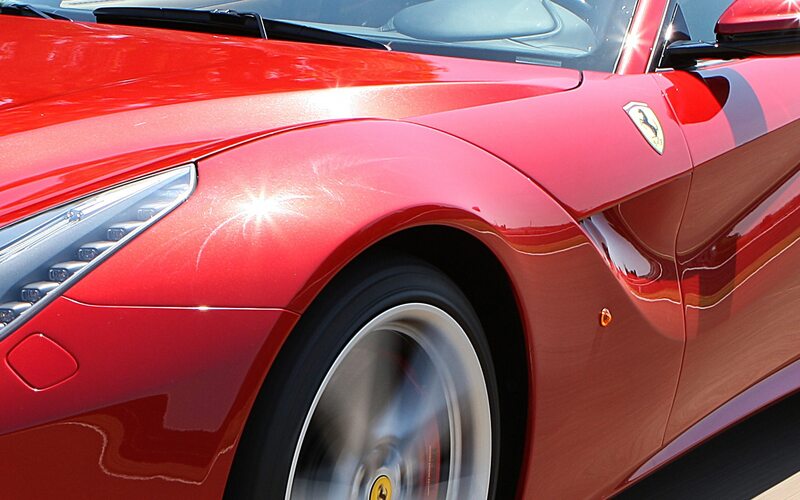 Driving a Ferrari is a fantasy that relatively few folks will ever fulfill. Actually owning a Ferrari is reserved for the elite few. But it is only the luckiest people on earth who are able to drive a preproduction version of Ferrari’s latest creation. 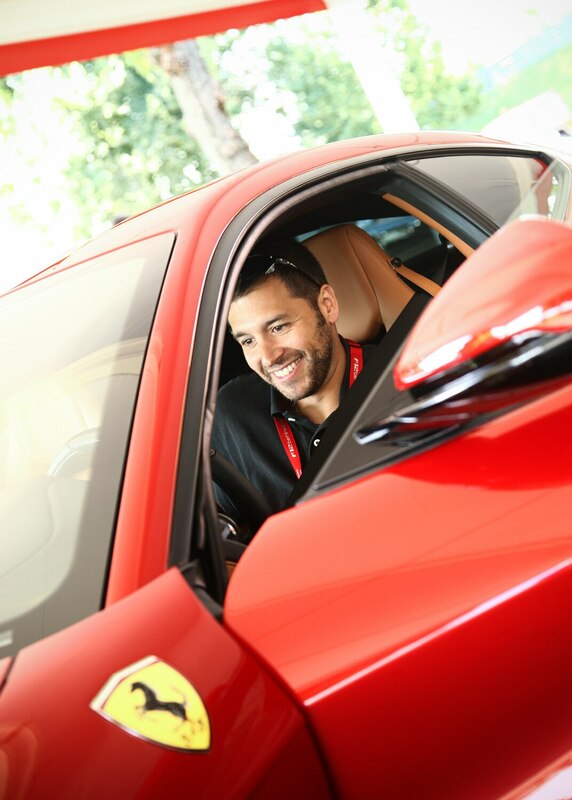 Who can resist the fanfare of the Ferrari fantasy? Especially when you’re invited to a private lunch with Ferrari boss Luca di Montezemolo. Especially when you’re given access to Ferrari’s Fiorano track and turned loose on the very roads that Ferrari uses to develop its cars. 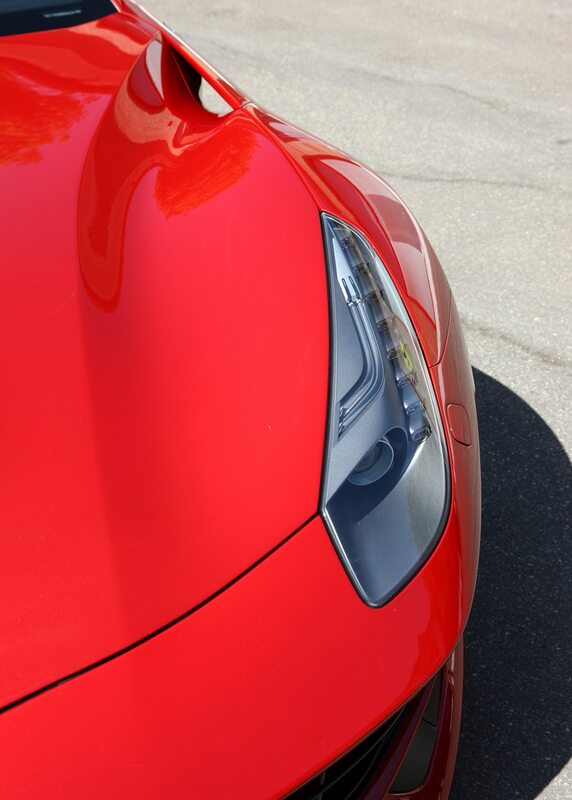 Especially when you’re given the keys to a 2013 Ferrari F12 berlinetta. Ferrari is a company obsessed with speed and performance, but it could be argued that continual advancement has come at the expense of driver involvement. Despite shrinking Fiorano lap times and swelling horsepower numbers, Ferrari road cars have become progressively easier to drive. Stability control systems mask insufficient driver talent, and automatic transmissions have made the clutch pedal extinct. This isn’t news to us. While waxing poetic about the cars’ capabilities, we’ve whispered words like “clinical.” Happily, Ferrari was listening. The first thing we’re told about the 599GTB Fiorano’s replacement is that one of the primary objectives was to make it more fun to drive at subfelonious speeds. 0.7 inch narrower, and a very significant 2.5 inches lower than the 599 it replaces, but it doesn’t sacrifice interior room or trunk space. To accomplish the latter, the F12 switches to a hatchback rear end, and the height reduction is made possible by mounting the engine 2.0 inches lower, a change that results in a dramatic 1.2-inch drop in the car’s center of gravity. Then there’s the steering. Just as German automakers start to compromise their sports cars (#Porsche911) with feel-free electric power assist that saves only a marginal amount of fuel, Ferrari maintains that steering feel is far too important to risk. When, at lunch, the Ferrari boss asked what we liked best about the new car, we didn’t hesitate: the steering. 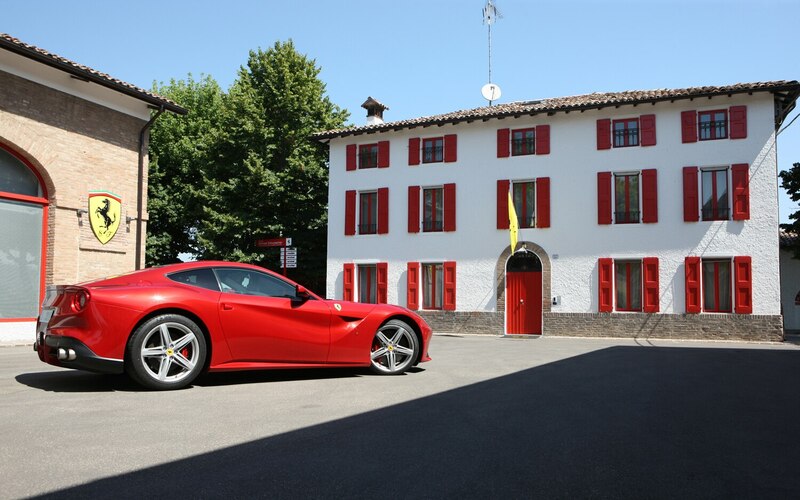 Driving a supercar you don’t own is stressful, especially on narrow Italian roads, but the F12’s talkative hydraulically assisted rack removes half of the anxiety. Knowing exactly what the front tires are doing and precisely where they are makes all the difference in the world. It helps, too, that the front end is high enough that it doesn’t scrape on angled driveways and the like. The F12’s steering might be featherlight, but it offers the best feel this side of an unassisted Lotus Elise. On-center feedback is ever-present, and with just two turns lock-to-lock, the ratio is so fast you’ll almost never need to move your hands off of the nine- and three-o’clock positions. In the rare event that the F12 understeers, the wheel will go limp in your hands. When (not if) the rear end comes around because you’ve asked for way too much power in a corner, the wheel will dance in the direction of countersteer. This is a car you could drift blindfolded. Porsche’s steering engineers should order an F12 right now. Lamborghini’s engineers, for their part, should invest in a good scale. Unlike the big bruiser from Sant’Agata Bolognese, the F12 isn’t made of carbon fiber.At this price point and volume level, Ferrari says price (a third of a million dollars) and capacity constraints (expected lifetime production in the four digits) would dictate a carbon construction method that would actually add weight. Aluminum, apparently, isn’t just the better choice, it’s the lighter choice. Without so much as a wink, Ferrari promises a curb weight of about 3600 pounds. If they’re not fibbing, that makes the F12 Berlinetta about a quarter-ton lighter than the carbon-tub Lamborghini Aventador. It’s also 40 hp more powerful. The front-mounted V-12 is a modified version of the direct-injected 6262-cc monster that debuted in last year’s FF. With a much higher compression ratio (13.5:1 versus 12.3:1), freer-flowing intake and exhaust, and more aggressive cams, it shoots 731 hp down the driveshaft. 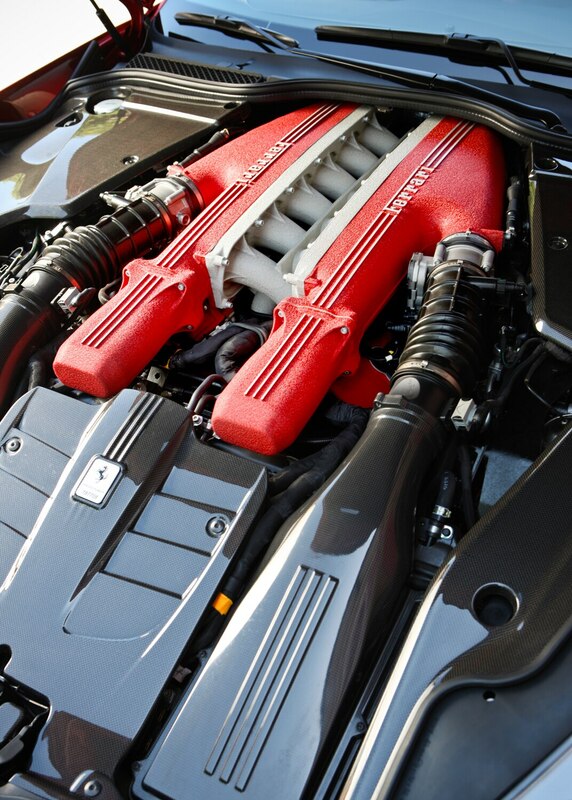 The massively oversquare (bore is 94.0 millimeters, stroke is only 75.2) twelve-cylinder responds instantly to throttle inputs, spinning like a drug-fueled Tasmanian devil from idle to its 8700-rpm redline and making the best V-12 noises in the business. For that last part, you can thank six-to-one exhaust headers and intake-resonance tubes that carry the induction honk straight into the cabin — an eardrum-pounding delight previously enjoyed exclusively by the occupants of the car you were about to overtake. There isn’t a single point in the rpm and load continuum where the V-12 makes noise; it’s always music — mechanical music, intake music, exhaust music. The Getrag seven-speed dual-clutch automatic transaxle has gotten better with time. It provides instant response to commands with shift times that are, for all intents and purposes, zero. The F12’s computers will play tricks to cut power briefly under full-throttle shifts, giving a glorious exhaust bark on upshifts, although Ferrari still hasn’t figured out that a driver who slams the pedal to the floor in automatic mode actually expects full acceleration. 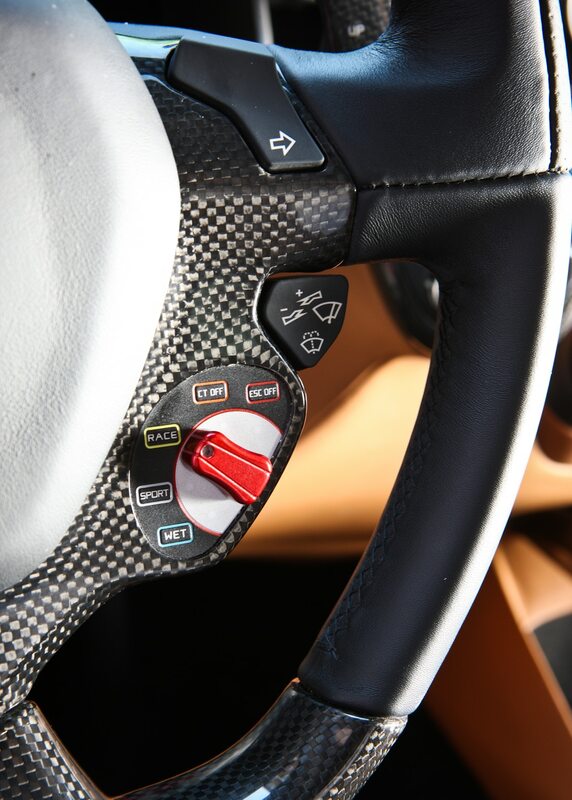 To extract all of the F12’s performance, you’ll have to use the steering-column-mounted paddles. 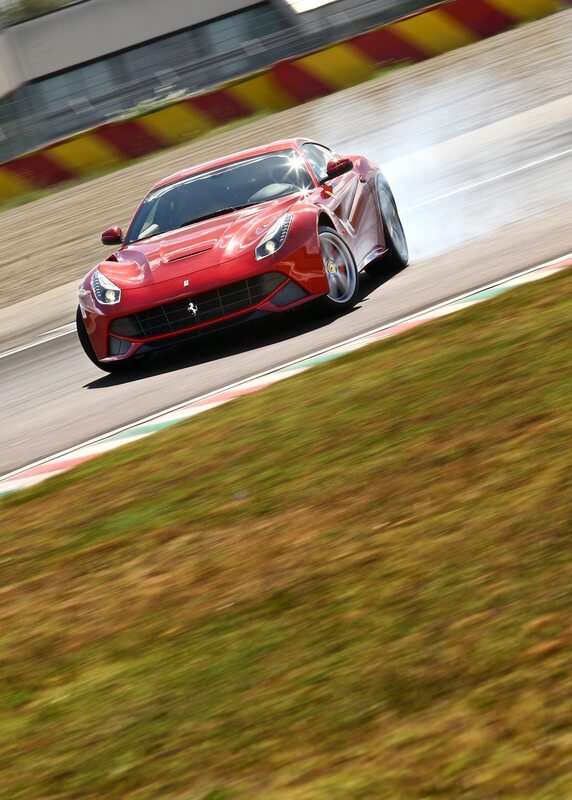 The F12 is the first V-12 Ferrari to use the E-Diff electronic locking rear differential, and it’s nearly magical in its ability to put power to the ground. 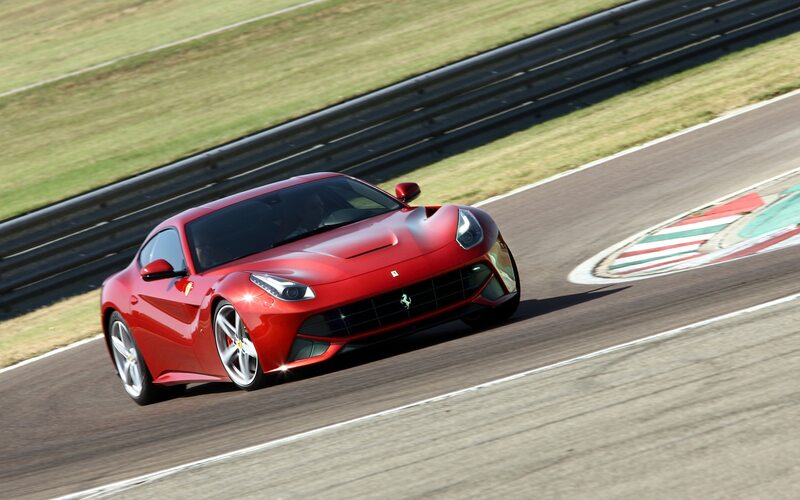 Mechanical grip is aided by a rear-biased weight distribution (54 percent of the F12’s weight is on the rear axle), a five-link rear suspension (the 599 used control arms), and enormous Michelin Pilot Super Sport tires (315/35s at the rear, 255/35s in front, all on twenty-inch wheels). Still, successfully getting 731 horses to the ground in first gear is no small feat — although the F12 can do it with surprising ease — and it results in a 3.1-second factory-claimed 0-to-62-mph time. 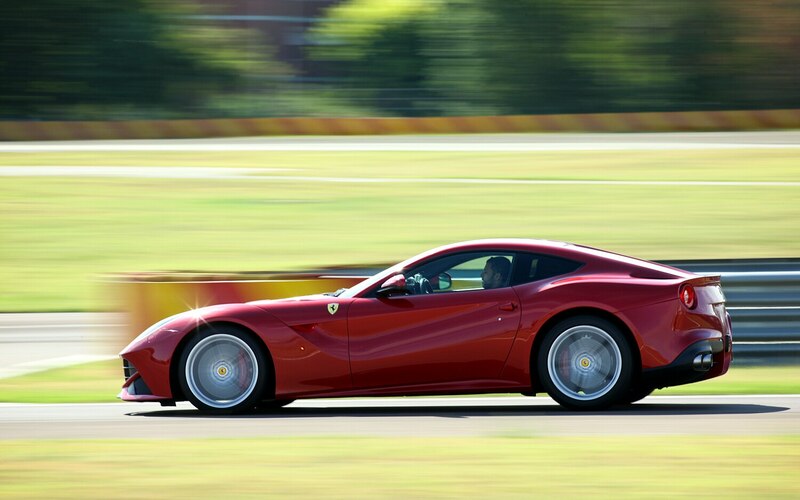 Seventh is just long enough to reach the F12’s 211-mph top speed — there is no extralong cruising gear, and yet the F12 still manages to sip 30 percent less fuel than the 599. The F12 corners so go-kart-flat that you’d swear there’s no suspension travel at all, except that the photos show a significant amount of body roll and the ride is appropriately compliant over bumpy pavement. Credit the computer-controlled magnetorheological suspension for all of the above. The new Ferrari is no McLaren MP4-12C magic carpet in the ride department, but it’s never harsh, never unduly firm, and always comfortable — unlike a certain bucking bull from Sant’Agata. Neither midcorner bumps nor straight-line jumps seem to faze it, either. Driven in anger, the newest Ferrari handles like a formula car, almost always perfectly neutral with a slight tendency toward oversteer. Since all of the large masses are well within the wheelbase and since so much of the weight resides in the rear, it rotates more like a mid-engine sports car than a front-engine GT, turning in instantly and rotating on an axis right at the driver’s spine. Or is it all rotating around the computer’s axis? This is the brilliance of modern Ferraris: the electronics are continually adjusting an incomprehensible number of parameters, but from the driver’s seat, the F12 feels like there are no computers at all. The stability control doesn’t interfere or even intervene, it merely influences. 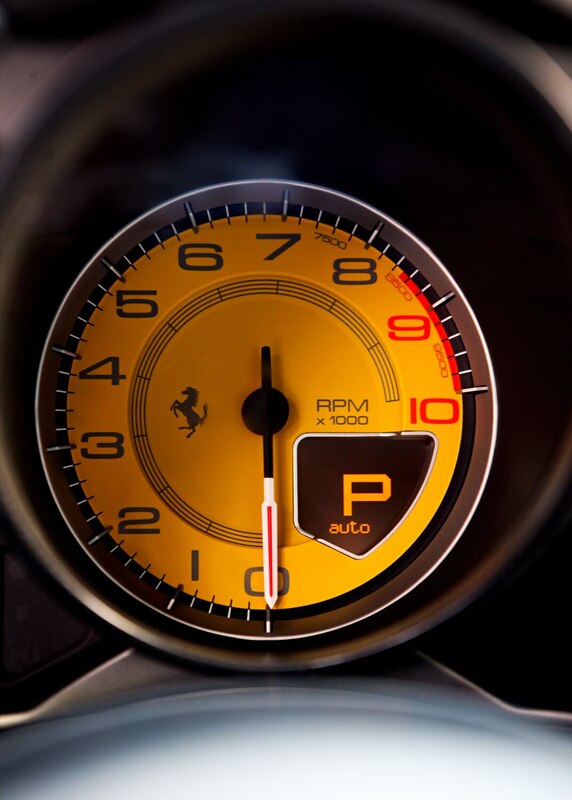 With all systems on, the F12 experiences more stability control interventions than an AA meeting at the Psychic Friends Network — but the sole goal is to deliver an Enzo-beating lap time without slowing you down and while preventing you from killing yourself. Drive the F12 like a New York cabbie, and the stability control warning light will flash continually, but the F12 remains the most idiot-proof pussycat this side of the Cowardly Lion. The F12’s styling is perhaps the best-yet interpretation of the new swept-back headlights of the 458 and the FF — thankfully without the FF’s smiling anime air intake — with none of the California’s awkwardness. On the road, it instantly reads as a Ferrari grand tourer: understated, elegant, and timeless. There’s no doubt that Ferrari took a purposefully conservative route here — after all, the funky FF is at the opposite end of the spectrum. That said, the F12 is aerodynamically advanced, with both a low coefficient of drag (0.30) and as much downforce as you’re likely to see in a road car (a claimed 271 pounds at 124 mph). Some of the downforce comes from the Aero Bridge, a novel aerodynamic device you might not have noticed. Look closely at the photos and you’ll see that part of the upper front fender has been removed, creating a tunnel that allows air to flow across the hood, out to the side, and along the door, creating downforce in the process. This is a whole new visual form — removing body bulk for aero when, conventionally, designers have added wings, spoilers, splitters, and diffusers. Inside, the F12 is typically Ferrari gorgeous, with enough controls and buttons on the steering wheel to confuse a C++ programmer. A new infotainment system has been codeveloped with Harman, but it wasn’t finished in time for our drive. Sadly, the high-res screen is visible only to the driver — a significant ergonomic foible in a car meant to take well-heeled (read: well-aged) couples on long trips. At least the F12 is easy to get into and out of, the firm seats are comfortable, and the driving position is natural. Up front, your view is punctuated by the tops of the air bridges; to the rear you see…not much. There will be an optional rearview camera. 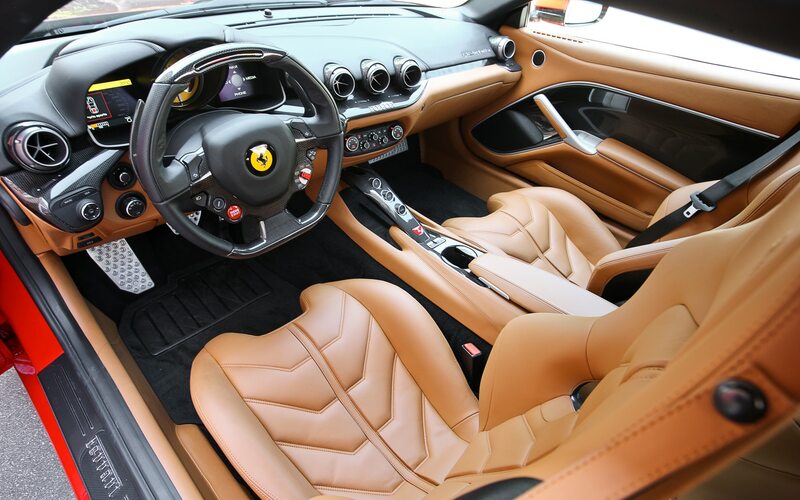 The 599GTB Fiorano was a fine car when it debuted, but its evolution models, the HGTE and the GTO, highlighted that it wasn’t quite perfect out of the box. 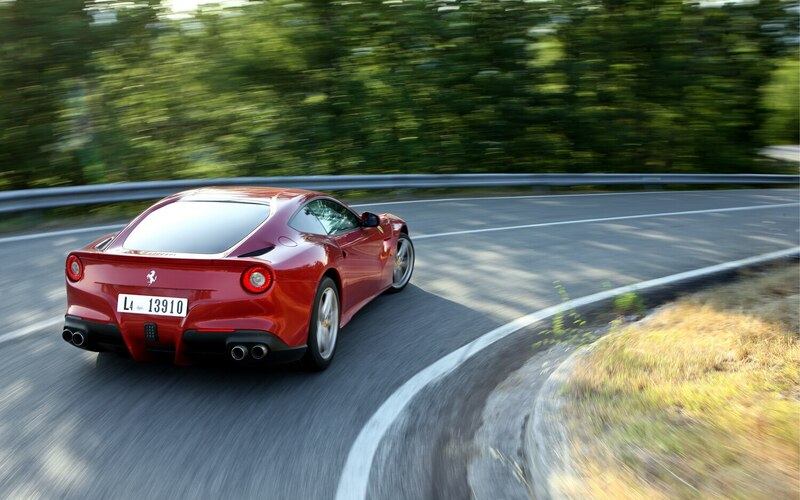 By contrast, the F12 debuts as a whole; one complete vehicle that scores tens in just about every category. There is probably no other car that combines this level of performance, elegance, drama, and luxury with this much driver involvement. Many supercars are special by virtue of their looks, their sound, their price, and their speed, but this is a Ferrari that, even in the absence of the brand’s mystique, is genuinely one of the world’s greatest cars. 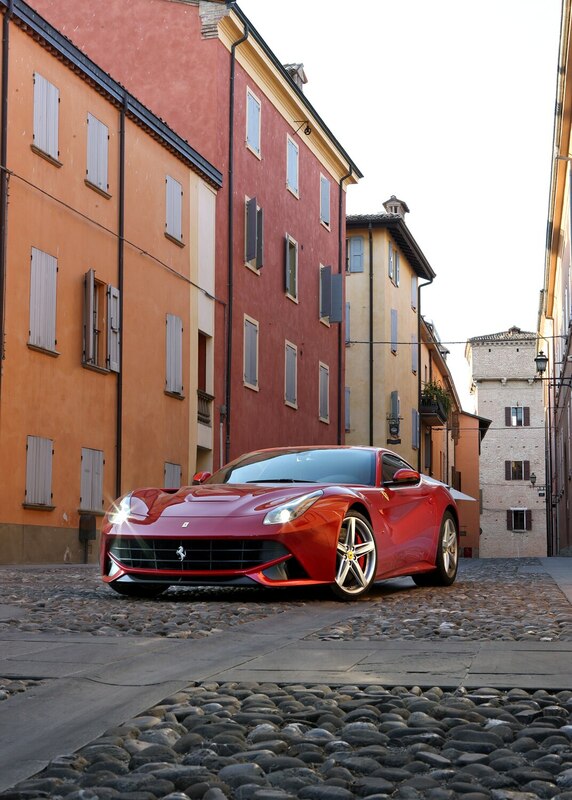 As such, the F12 Berlinetta resides at the intersection of fantasy and reality. I’d never really driven a 1930s car, but ever since I saw a picture of a Riley Kestrel 12/4 six-light saloon half a lifetime ago, I’ve wanted one. Around my house it became a joke. Whenever anyone asked me what I wanted for my birthday, I’d say, “A Riley Kestrel 12/4 six light.” For good reason. The deco-streamliner movement of the 1930s never had a better exponent than this fastback, four-door gem, as handsome as the raciest, coachbuilt 1930s Bentley but smaller and better-looking for it. Earlier this year, after spending decades talking about it, I took the plunge (thank you, Premiere Financial Services, antique auto lessors). A 1936 Kestrel Sprite I’d admired was for sale. And now that it’s living with me, I can see why Rileys were so well regarded in their time — acceleration from rest feels like that of a ’60s British car. Only the 1930s Riley has twin cams (activating pushrods), so it’s more modern than most ’60s British cars. Plus, it’s even lovelier than I’d imagined. The extra rear side windows (two of the six “lights”) and fastback slay me. Fantasy fulfilled. A father’s promise never fulfilled: to tour the world, attending every major auto show in one year. Start in August at Pebble Beach, September at Frankfurt or Paris, November at Los Angeles, December at Tokyo, January at Detroit, February at Chicago, March at Geneva, April at New York, and May at Beijing. 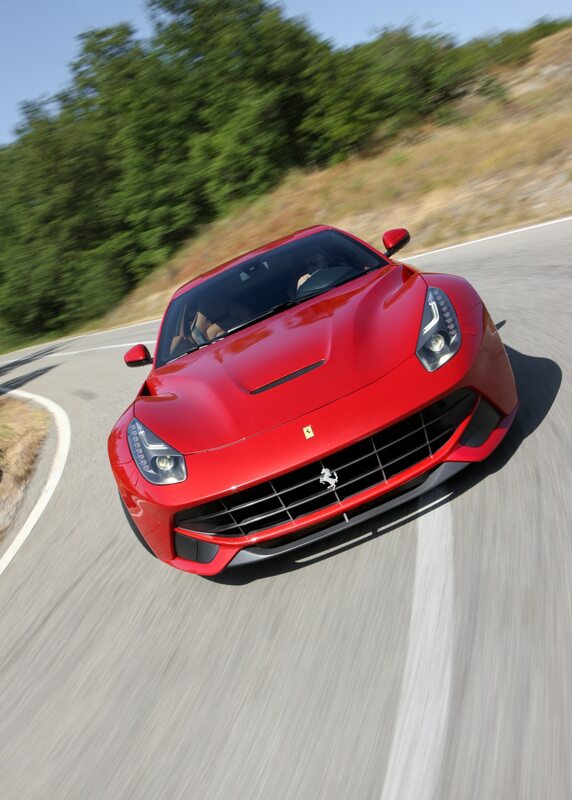 The 2014 Ferrari F12 Berlinetta is the most powerful front-engine V-12 Ferrari ever produced.